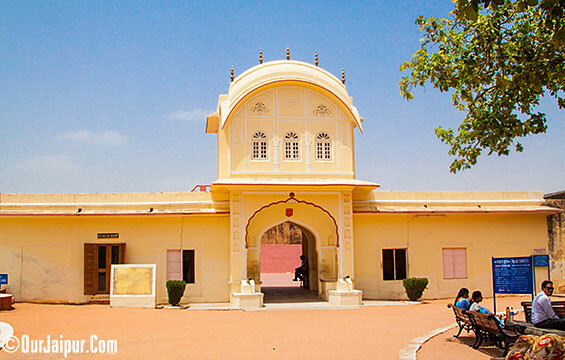 Jaigarh Fort is one of the biggest, very Important and well maintained fort in Rajasthan. It was originally built to protect Amer Palace, it is Connected to Amer Palace with Secret Tunnels which are open for tourists now. 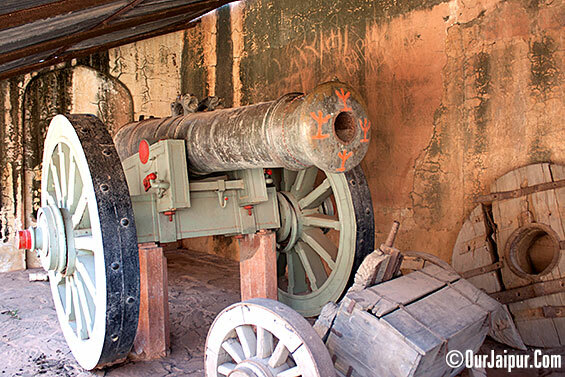 Jaigarh Fort houses the world’s largest Cannon on Wheels “Jai Ban” (Jaivan). 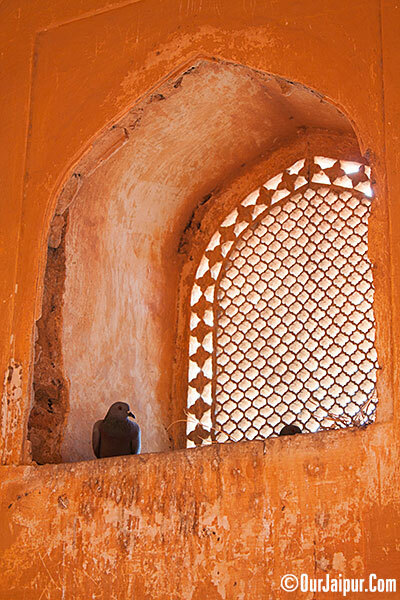 The Jaigarh Fort is built with the thick walls of Red Sandstone and stretches 3km from North to South and 1 km in width. Which houses Residencial Palaces, Water Reservoirs, Entertainment areas, Cannon Foundry, Watch tower, Temples, Museums, Garden and so on. 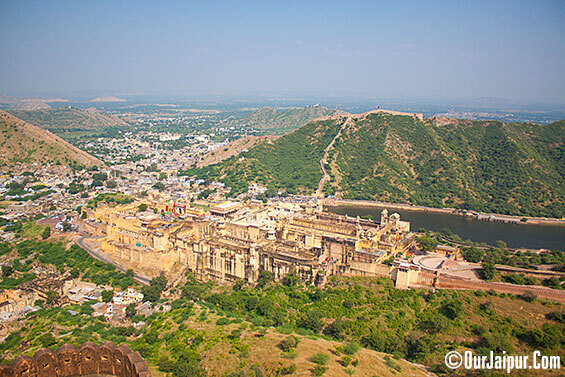 Jaigarh Fort is 15km from Jaipur, Rajasthan, India and 1.5km from Amer Palace. 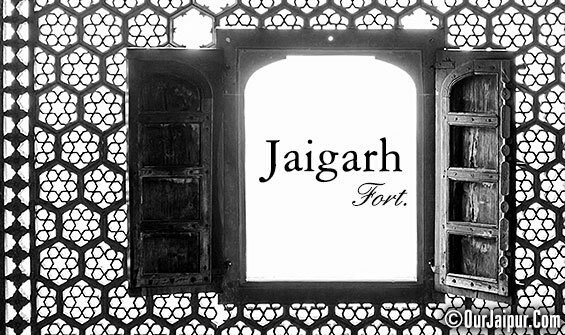 Jaigarh Fort is 602m above the sea level. 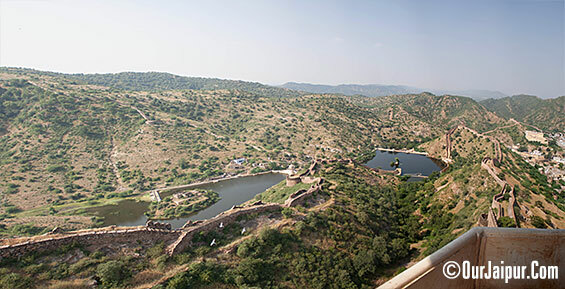 There are Six major Categories of forts and best among them all is “Giri” or “Parvata Durg” (Hill Fort) and Jaigarh Fort is a Hill Fort it is Built on “Cheel ka teela” a hill surrounded by Aravali Hills. Just like a Crown on Head. ‘Kakil Deo’ was the first ruler who laid the foundation of Kachhawaha Dynasty in ‘Amber’ in 11th Century. 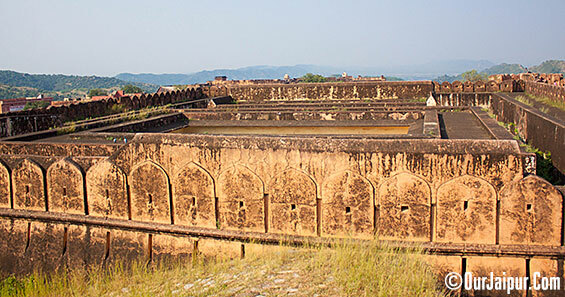 Then after every Ruler that came in power had developed the fort, It is said that the ‘Mirja Raja Jai Singh’ (1621-1667) was known to be the major contributor for the development of the Jaigarh Fort. 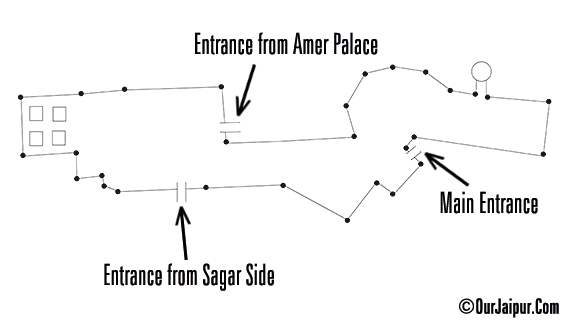 To understand better let’s Look at the Layout of Jaigarh Fort, there are three entrances to the fort. ‘Doongar Gate’ (Main Entrance) earlier it was back entrance of the fort it was constructed in 1942 by ‘Maharaja Sawai Man Singh-II’. 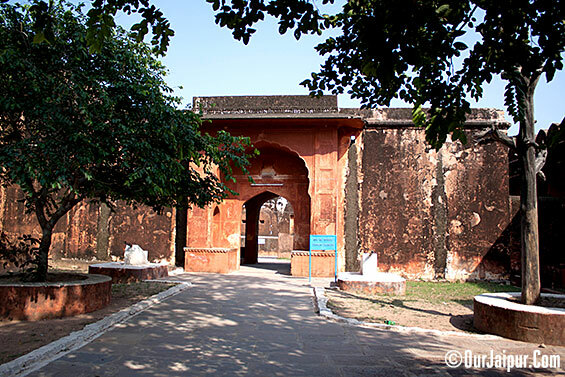 ‘Awani Gate’ was constructed with the fort itself it had the secret tunnel to connect ‘Jaigarh Fort’ and ‘Amer Palace’ Now it’s not that Secret but it still connects ‘Amber Palace’ and Amber village. 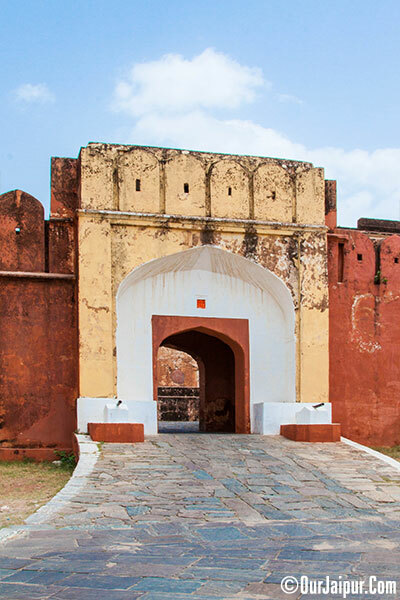 ‘Sagari Gate’ was the Original Entrance from the ‘Sagar’ Side but nowadays not in the use. 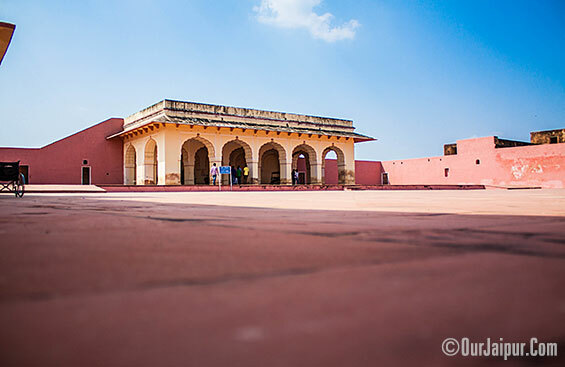 When you will enter through the ‘Doongar Gate’ (Main Entrance) you will land at the Southern Courtyard which has Three Water Tanks for the day to day use of Soldiers. The Dimension of the Largest Tank is 158x138x40 ft. Covered with the Roof supported by 18 pillars Constructed inside the Tank, to keep the Water clean and save it from Evaporation. Southern Courtyard Second Water Tank. Second Water Tank 69x52x52ft. 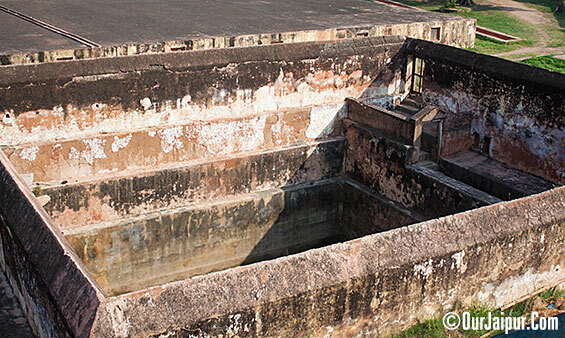 There is a very Interesting fact and story attached with this Water tank. 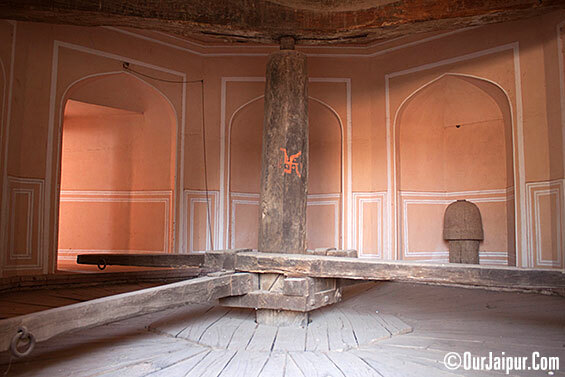 There are Nine Holes in the roof of this tank and there is a room under each hole, these rooms were used as the treasury house until the reign of ‘Maharaja Sawai Jai Singh-II’. 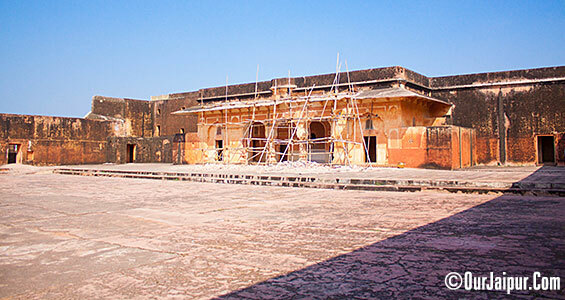 It is said that Jaigarh Fort has Huge Treasure and Lost History of Hundreds of years hidden in it. Mostly all the palaces and Forts are in control of Government Nowadays but this fort is Still under the Control of Royal family. Many people and Government had tried to find it but No luck till now. There is also a Story that in 1970’s ‘Indira Gandhi’ Prime Minister of India and Rajmata ‘Gayatri Devi’(Queen of Jaipur) had very Sour relations between them. So at Time of Emergency the Rajmata ‘Gayatri Devi’ was imprisoned and an income tax raid was conducted on the Royal Family. In that raid an Old Document from ‘Sawai Jai Singh’s’ Time was found which mentioned the existence of Huge Treasure in the Jaigarh Fort. After hearing about this treasure ‘Indira Gandhi’ send her Crew to find this Treasure after which the Jaipur – Delhi Highway was closed for two days and it is said that she took away all the Treasure. But as I said this is a Story the Incidents happened are real but there is no Proof that she got the Treasure or not? 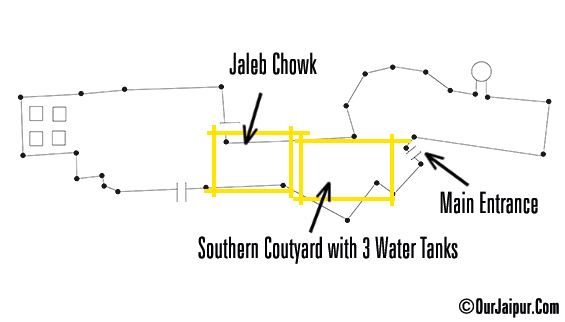 Southern Courtyard Third Open Water tank 61x52x27ft. 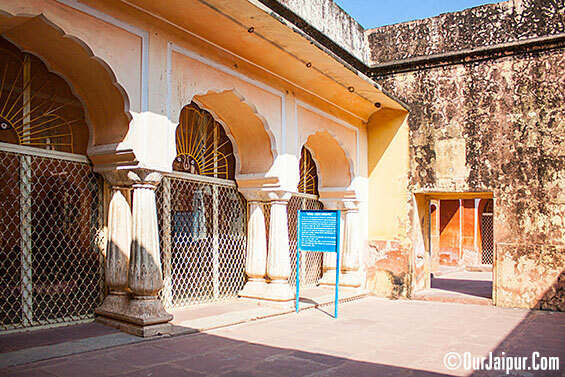 From Southern Courtyard we enter into ‘Jaleb Chowk’ it is one of the Important Courtyard in Front of Palace Complex. There is an Museum Gallery and Offices on either sides. 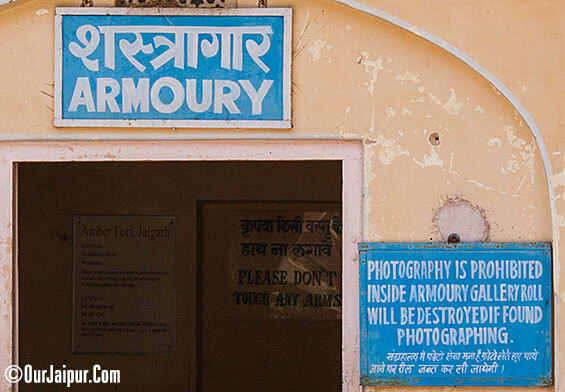 Photography is Prohibited at Armoury. Temple of Ram Harihar at the Left Corner of Jaleb Chowk. In India Fighting and Worshiping goes hand in hand. Hari (Vishnu) and Har (Shiva) are two main Gods of hindus, Vishnu is Creator and Shiva is Destroyer. 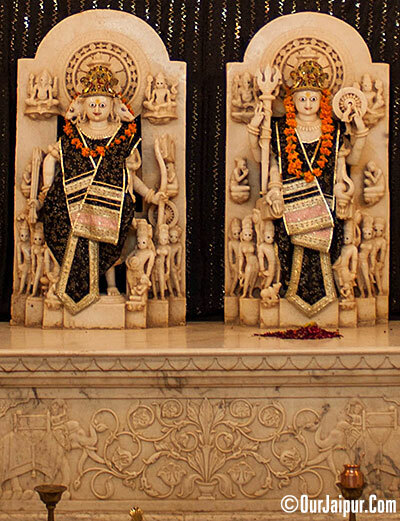 The Idols are carved in Marble which could be from 13th Century. Temple of Bhairav is also at the Left Corner of Jaleb Chowk. 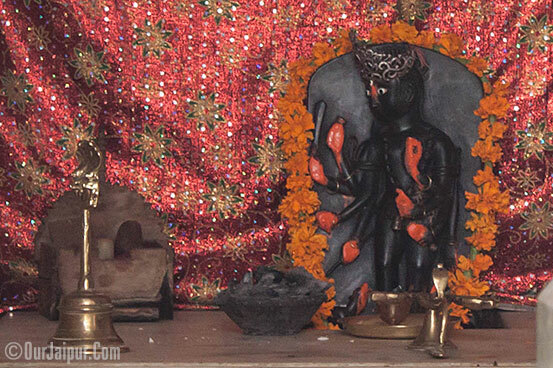 Bhairav is the angry form of Shiva and worshiped as an guardian. Idol of Bhairav with 8 hands holding Weapons. From Jaleb Chowk Now we are entering in Palace Complex. 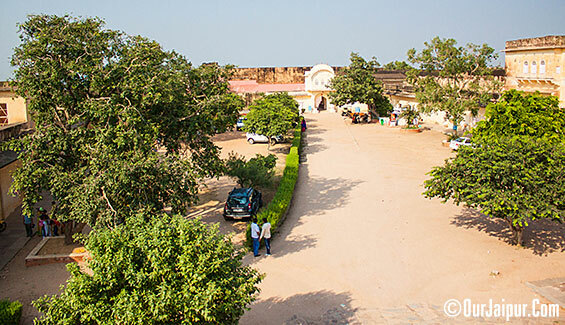 This is the Main Entrance for the Palace Complex. 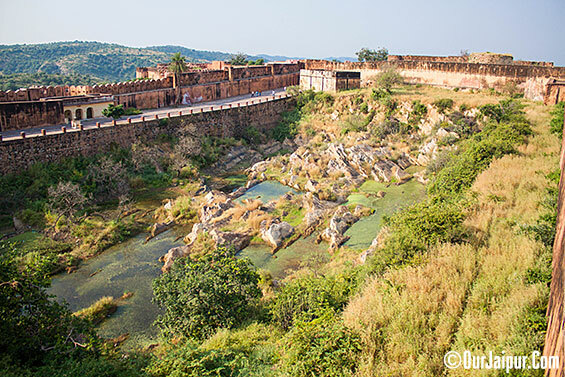 Situated on the North side of Jaigarh Fort. Palace Complex shows the Wealth and Power of Rulers of Amber. There are Different Places for different Moods, Occasions and Weather in Palace Complex. 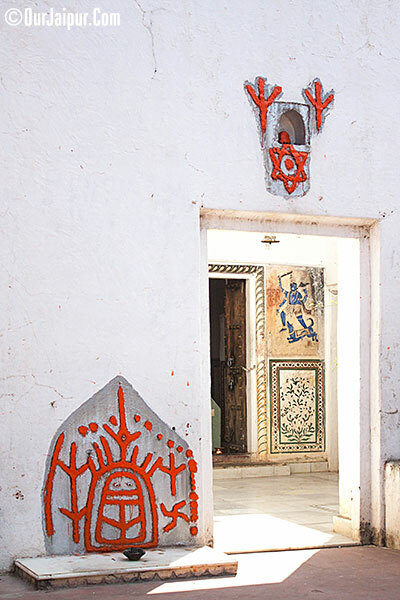 Each one of the Place has well decorated Canopies, Carved pillars and different taste of Architecture style. 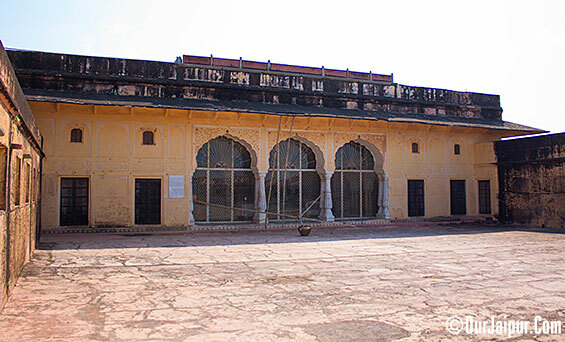 Subhat Niwas is the first Complex of Palace as we enter from Jaleb Chowk. It is a place where Kings use to address his army. 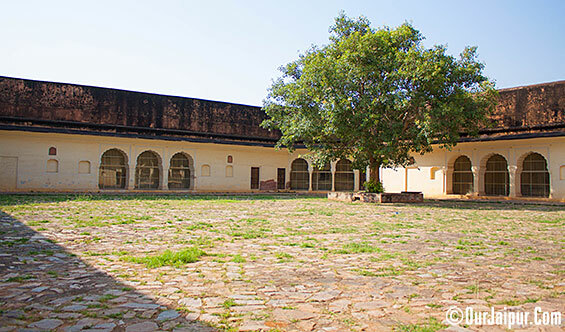 Subhat Niwas has an 69x34ft hall where Soldiers were briefed in more detailed way about the Strategies and plans. Today artefacts are kept at this place for tourists. Elephant Seat at Subhat Niwas Hall. 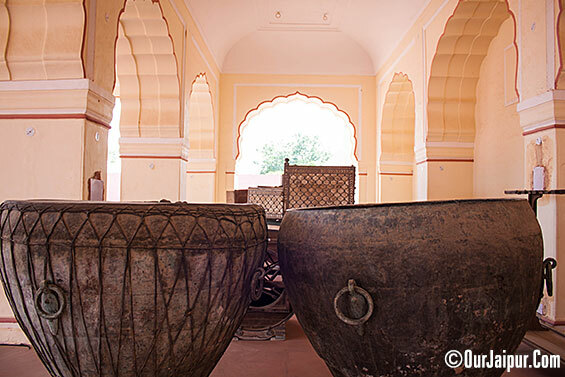 Big War Drums at Subhat Niwas Hall. Lakshmi Vilas is one of the beautiful place in the Complex, It was used as Royal Drawing Room and for other Ceremonial Occasions. 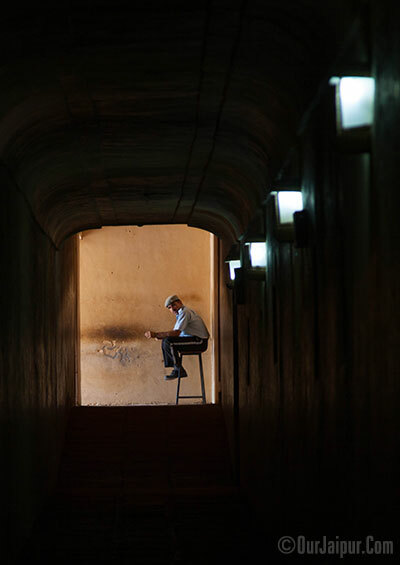 When we Proceed from Lakshmi Vilas there is a Long Dark Passage which leads you to many different parts of Complex. Dining Complex has open courtyard and two halls one for Queens and one for Kings. 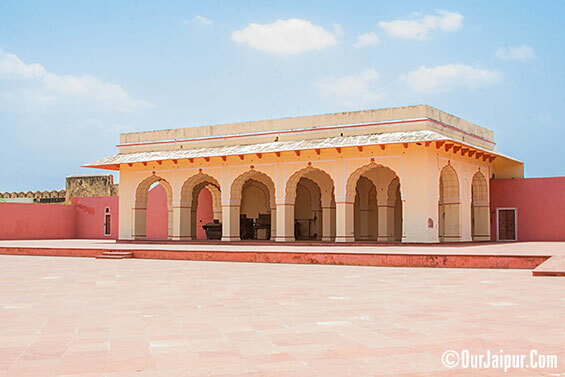 Recreated view of Kings dining hall at Jaigarh Fort. 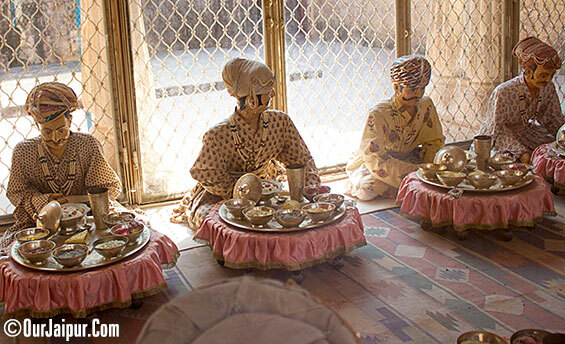 Recreated view of Queens dining hall at Jaigarh Fort. 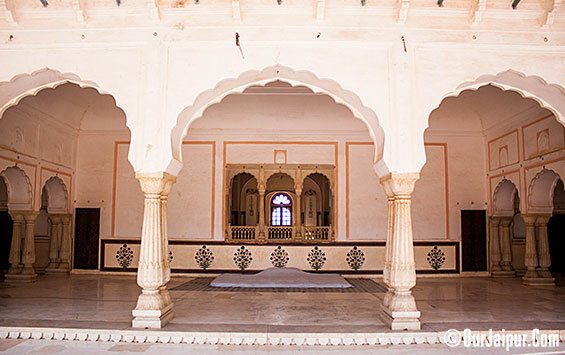 Lalit Mandir is two storied place to stay in Summers. 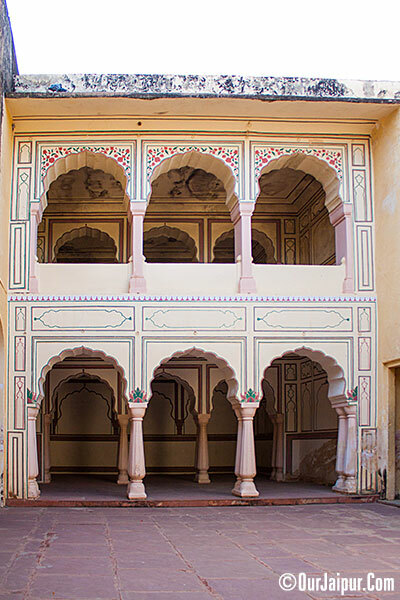 The upper storey has bedrooms with attached balconies. 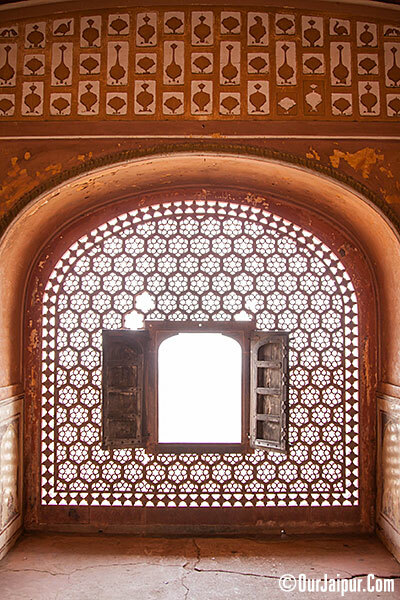 The bedrooms have stone Jharokha Screens with Jali work to allow cool breeze to come in. 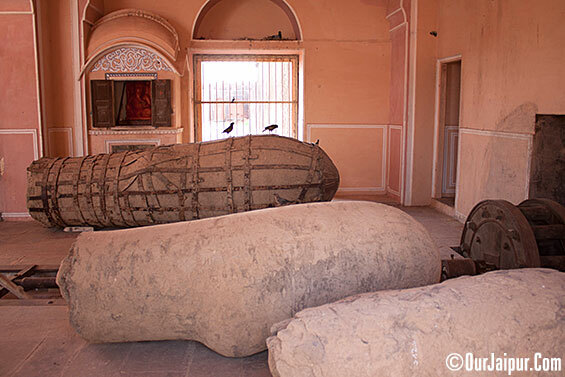 Few artefacts inside Lalit Mandir. View of Sagar Lake from Terrace of Lalit Mandir, Jaigarh Fort. 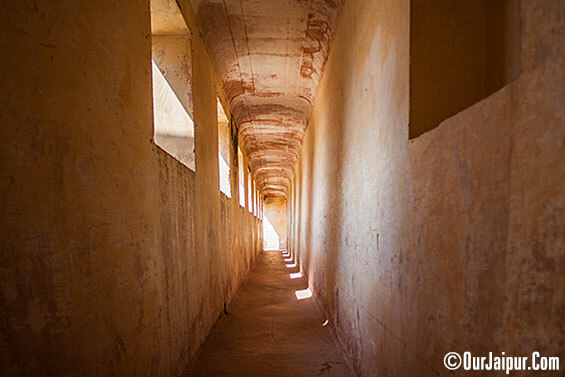 There are Many Covered &Uncovered long passages or tunnels in the Fort which are very Interesting. Double storied Auditorium for Leisure and entertainment time. Basically Music, Dances and Puppet show were the main source of Entertainment at that time. 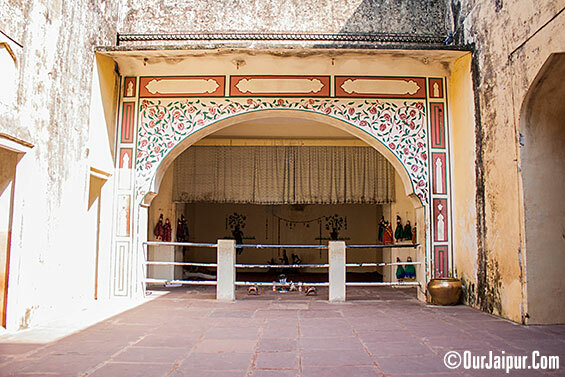 Vilas Mandir was built in 17th century, It was for the get together of Ladies of Royal Families. Renovation Work in Progress of Vilas Mandir, Jaigarh Fort. One of the Jharokha of Vilas Mandir. 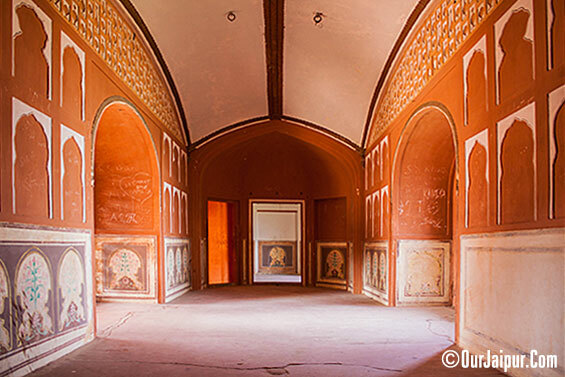 Inner Hall with ‘Araish’ Plaster Work- Vilas Mandir, Jaigarh Fort. I just Like this pic, Jharokha at Vilas Mandir, Jaigarh Fort. 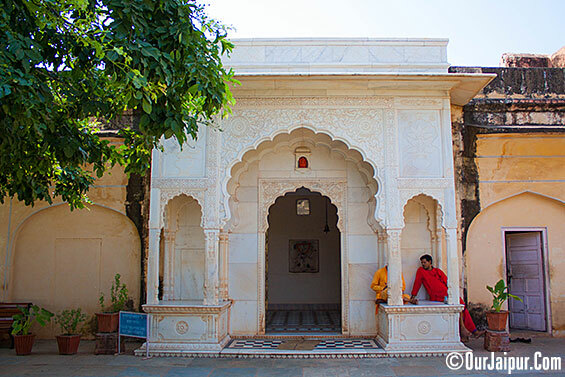 ‘Aram Mandir’ is a Garden House built in 16th century for the relaxation of Royal members. 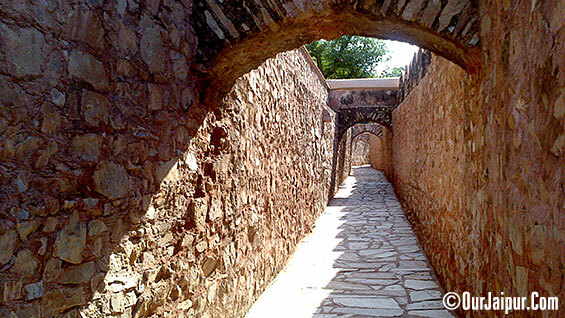 Path way to the Corner of Jaigarh Fort. Royal Garden Just below the ‘Aram Mandir’. View of Amber Palace from Jaigarh Fort. 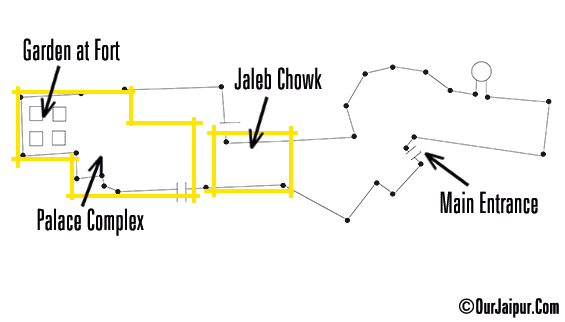 So after finishing the Palace Complex we again come to the Jaleb Chowk. 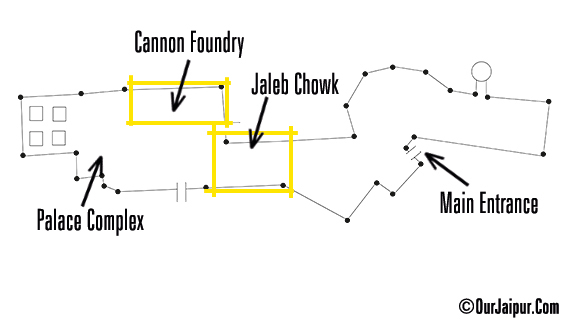 At right side corner there is a way for Cannon Foundry. Cannon ‘Bajrangvana’ is Decorated with two dolphins on it. It was built in A.D. 1691. It was driven to the battle field by 32 Oxen during the war time. ‘Bajrangvana’ has iron sleeves inside the barrel which provide more resistance to barrel. ‘Surya Mandir’ was built in 11th century and had gone through many changes. It has Seven Veranda with rooms in interior, nowadays it’s kind of small museum of tools of Cannon Foundry and Blacksmiths of old times. Moulds for casting cannons at the Furnace and Drilling Complex, Jaigarh Cannon foundry. Drilling Complex, Jaigarh Cannon foundry. 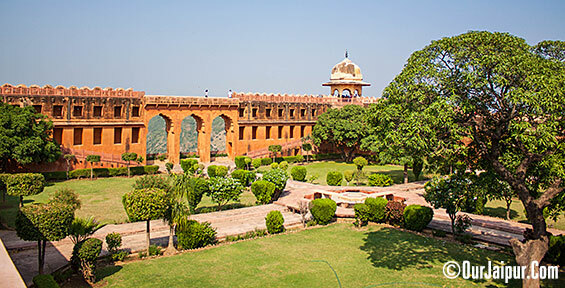 SouthWest Block of Jaigarh Fort. 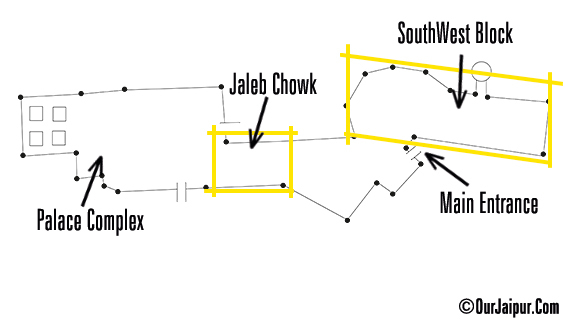 After completing the Cannon Foundry we Come back to Jaleb Chowk from there to Southern Courtyard and from there we will enter in SouthWest Block. Entrance Gate for SouthWest Block. ‘Vijay Garhi’ is a small castle in southwest block of Jaigarh Fort and it was used for armoury and today also it was used for same purpose. 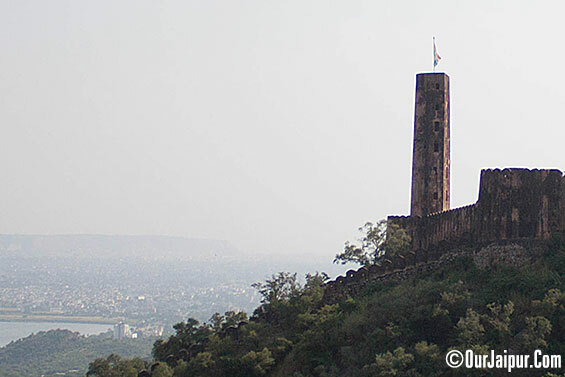 Diya Burj (Watch Tower) it is Seven story high and is the highest point in Jaigarh. Jaipur flag flies high on this and a huge Oil lamp is lit on the Birthday of Maharaja. 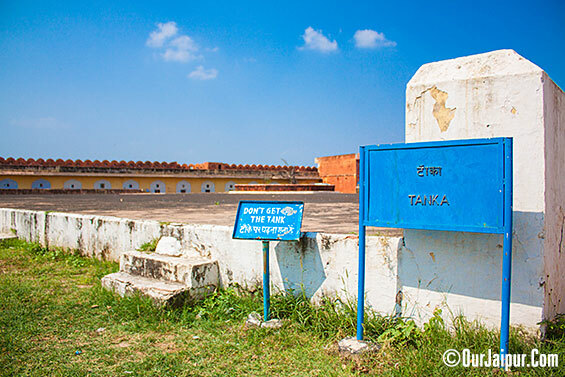 This place is Known as ‘Nathawaton Ka Tanka’, Which was used for Collecting water. 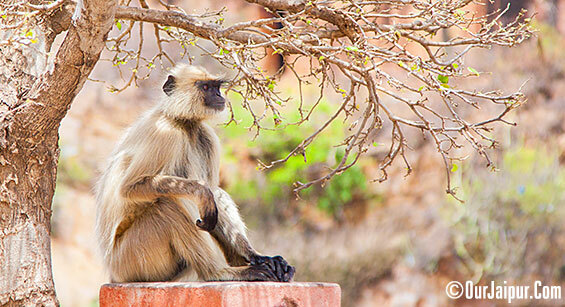 There are also few Macaque Monkeys and Langur Monkeys in this part of Jaigarh Fort. 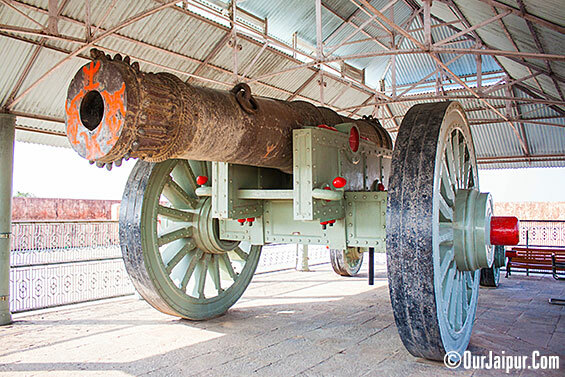 Jain Ban (Jaivan) the largest cannon in the world on wheels was Made in Jaigarh Fort Cannon Foundry in 1720 during the rule of Maharaja Sawai Jai Singh-II. 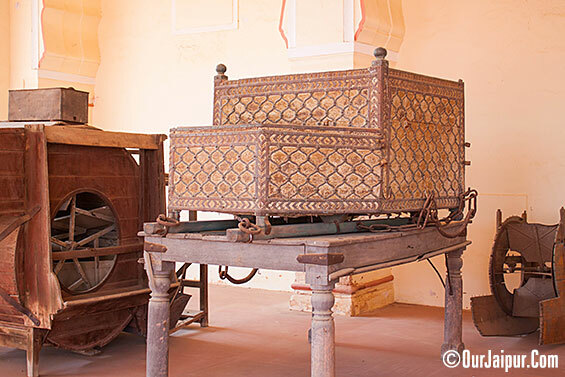 Jaivan rests on a high four wheeled carriage, with 9ft high front wheels and 4.6ft high rear wheels. The Barrel is 20.2ft long and 50tons heavy. The circumference at tip is 7.4ft and at rear is 9.4ft. this barrel rests on 24ft long shaft. It is beautifully carved with floral designs, an elephant rest on the tip of barrel, pair of peacocks are carved in the centre and pair of Ducks decorate the rear of Barrel. Approx 100kg of gun Powder and Cannon ball weighing 50kg is required for each fire. In History it has never been used in Battle field, just test fired once. The Cannon ball was landed at Chaksu 40km from here the Impact formed a pond at spot. It is said that Nine people including the gunner and an elephant were killed due to the shockwave of the fire and many houses collapsed in Jaipur. So on the whole Jaigarh Fort is Highly Recommended. Timings are from 9:00hr to 16:30 and yes it is Open everyday. Thank U Marta, Once you will start knowing more about Jaipur, Rajastan. You will love this place. 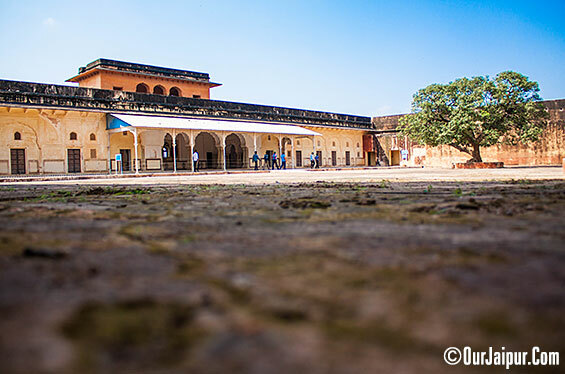 Lovely post, Such a detailed description about the fort, it feels like a virtual tour and yes lovely photographs. 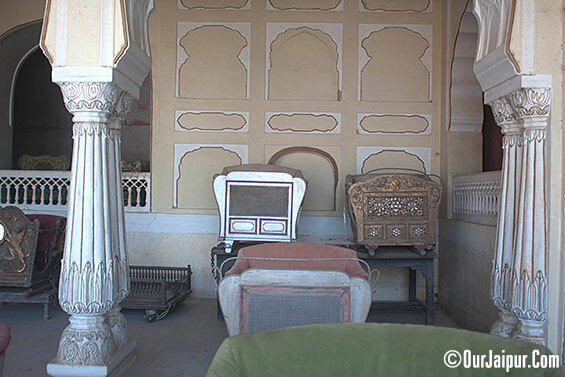 Thank U Shilpi I try my best to provide every detail in my Post about Jaipur. Lovely informative and detailed description, OJ and loved the images. As usual explained in details with stunning photographs. 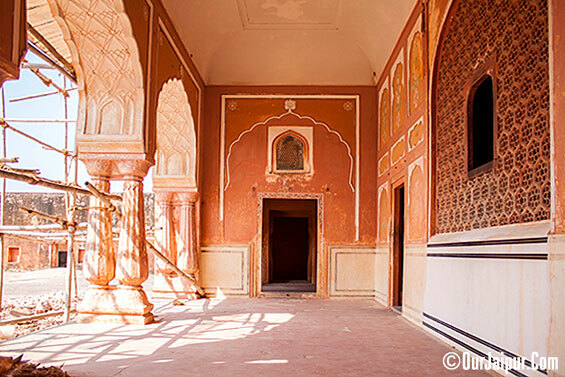 Jaigarh Fort is stunning with wonderful history behind it! 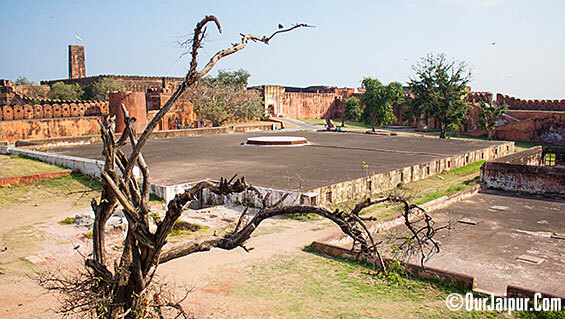 Yes Renuka Jaigarh Fort has the history of more than 1000 years. Would love to visit it, amazing photos and very detailed description! I will suggest it to my boyfriend who is an architect! He will really like it! Lovely shots and everything is stunning. How charming, and your pictures are amazing!!! Incredible;e place! the photos are amazing and so inspiring!!! Really nice place and pics! Amazing architecture and fab pics!!!! Wonderful shots of fort and palace. I am inspired to revisit. Jaipur, the Pink City. loved the photos. Thanks for your knidly comment! Your Jaipur is so beautiful. I loved coming for a stroll in your palace. oh wow very well explained! I add a post of it some weeks back too, but obviously urs is much complete! great job! It's like a good place to visit. Lovely pictures . Nice to know about this fort in details . I love the site and the pictures!!! beautiful! I would love to visit! I want to visit it so bad! great pictures, the Fort looks amazing!! wow. a lot of fantastic pictures and place! Thank you so much for stopping by! Hope you have a fabulous weekend. Oh really beautiful place, I love it your pics because is like be inside that place. wow wow beautiful place n lovely clicks..
Lovely place honey :) C, xoxo. 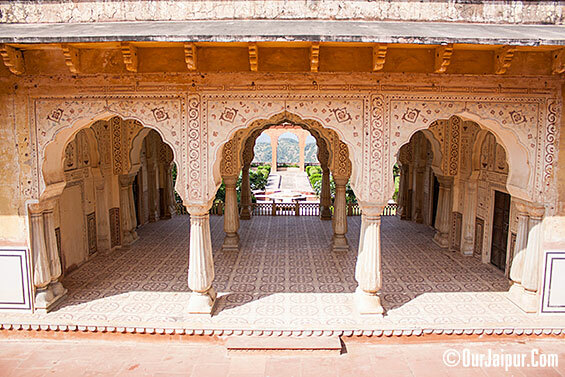 Well, Jaigarh fort is a very well known and beautiful place in Jaipur. 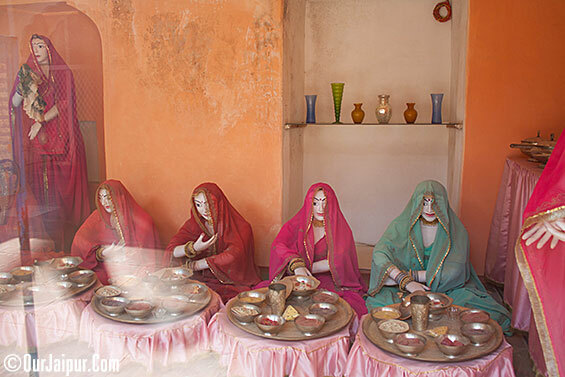 There are several heritage places there in Jaipur, and it is one of the best available having very high number of visitors on a daily basis. It is an excellent place for sure. I have seen lots of historical collections there made of various things including wood, marble, metal and glasses. 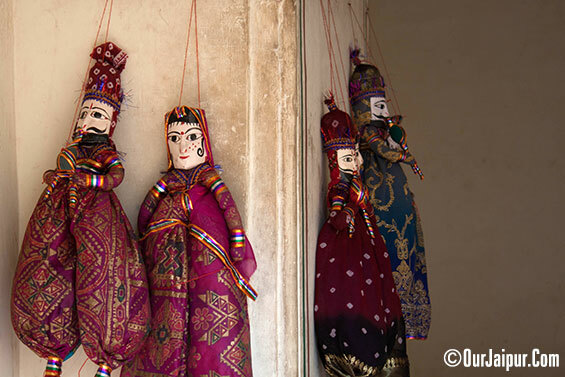 Some creations including traditional marble handicraft type of items were awesome there. Kathak performance by Manjari Kiran.